I love this cookbook, Ive made the lobster risotto (several times) and the chicken tangine (tho I used lamb). Cooking each recipe is a passionate lovely experience and the food is sublime! Excellent, simple & very easy. Make sure you have good herbs & good, preferably homemade, creme fraiche. More of a technique than a recipe, nonetheless even skeptical friends loved these crispy caramelized parsnip sticks. Excellent apple tart recipe that I've made several times. Useful to do when entertaining as the prepared (but unbaked) tart can sit in the fridge for up to 8 hours. Smells delicious and soooo good. Refined and elegant but still lusty. Pg. 78. Good, but not exceptional. This is our favorite recipe for Halibut --especially when we can get the Atlantic version. Last night we added fresh yellow peppers to the cherry tomatoes. We love the spice rub and there's usually enough left over to use again. We have a Greek deli for tzadiki and use that instead of Tanis's raita, so it's plenty thick. And we have cooked this on the grill, in a cast iron pan , and under the broiler. All work fine if you are careful not to overcook the fish! Pg. 124. Due to circumstances I was not able to grill the halibut, so ended up broiling them and they came out perfectly cooked after 6 minutes. I would say that the spice rub was a bit too intense, but the flavors were nice. The yogurt sauce 'raita' was not to our liking. Don't expect anything that looks like the photo on pg. 117 where the raita is thick -- this was a very runny sauce and the flavors just didn't work. The minced mint saved the day. This recipe also calls for yellow tomatoes cut into small wedges and served raw. I chose to cut the tomatoes into halves and broiled them with a bit of olive oil drizzled. Excellent! Used the sweetest cherry tomatoes from the garden with some ricotta cheese from Italy. Simple yet impressive. Will definitely make again! Pg. 134, I had high hopes for this, yet it yielded average results. I've made pork loin roasts with other recipes that were far better. Very well flavored, especially leftover. Aesthetically a bit dull. I like the addition of the almonds - a nice crunch. However, the brown sugar makes the batter a bit unattractive, given Clafouti typically has a nice yellow colour from the yolks. I used almond slivers in this and I really liked that element. Overall this is a bit too sweet - and I have a sweet- tooth. Have a feeling it’ll be better chilled. This was delicious. I made individual clafoutis in small Spanish ceramic dishes. The recipe made 8. The brown sugar made the batter very rich and caramely. I had beautiful fresh local cherries. I did not include the almonds. Served with a simple vanilla bean icecream. Quick & easy rustic dessert, I make this in a cast iron skillet and also use this as a base recipe for improvising other fruit and extract combinations. I've also made this with almond milk and gluten free flour and it came out great. Super quick and easy to make, delicious! Delicious & hearty. Serve with lemon slices. I frequently sub dried chickpeas soaked overnight for the fava beans and have also omitted the lamb to make it vegetarian. Follow DT's advice about tasting the broth for spiciness. It needs to really have a kick when you taste it...I think I was assuming some more heat would develop as the stew cooked down but my mild Hatch chiles ended up totally lost with the other ingredients. It didn't taste bad, but wasn't what I was expecting or hoping for from green chile stew. Makes quite a bit. A little dry. Broccoli Rabe comes thru very bitter. I liked this, but I don't believe that Richard did. Only made 1/2 of recipe, which filled 9x13 pan. A little grated fontina might be nice mixed in. Should probably parboil the broccoli rabe, as suggested. Skipped that step and it would have mellowed the bitterness, I think. p. 260 - A baked pasta dish, enough to feed an army if made in quantity suggested. I agree w Cheri in that the dish is fairly dry using only 8 oz of ricotta for 2 lbs of pasta. I halved the recipe and after a quick taste-test I ended up stirring in additional ricotta to moisten the pasta a little. Thanks Cheri for your note. I didn't make my own sausage, just added some additional fennel seed to the dry pan prior to cooking my fave store bought . Mr bc, a rapini-hater, was not a fan of this dish. When I served leftovers I spooned tomato sauce over top and this brightened the dish and, moistened it. I wouldn't make this again. So many other recipes to try! Forget about getting back to the land, David Tanis just wants you to get back to the kitchen. For six months a year, David Tanis is the head chef at Chez Panisse, the Berkeley, California, restaurant where he has worked alongside Alice Waters since the 1980s in creating a revolution in sustainable American cuisine. 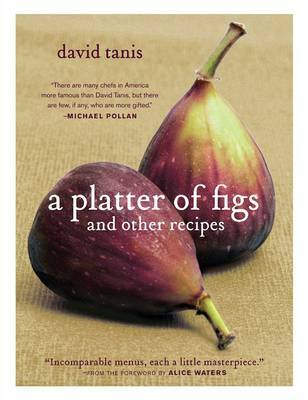 The other six months, Tanis lives in Paris in a seventeenth-century apartment, where he hosts intimate dinners for friends and paying guests, and prepares the food in a small kitchen equipped with nothing more than an old stove, a little counter space, and a handful of well used pots and pans. This is the book for anyone who wants to gather and feed friends around a table and nurture their conversation. It's not about showing off with complicated techniques and obscure ingredients. Worlds away from the showy Food Network personalities, Tanis believes that the most satisfying meals - for both the cook and the guest - are invariably the simplest. Home cooks can easily re-create any of his 24 seasonal, market-driven menus, from spring's Supper of the Lamb (Warm Asparagus Vinaigrette; Shoulder of Spring Lamb with Flageolet Beans and Olive Relish; Rum Baba with Cardamom) to winter's North African Comfort Food (Carrot and Coriander Salad; Chicken Tagine with Pumpkin and Chickpeas). Best of all, Tanis is an engaging guide with a genuine gift for words, whose soulful approach to food will make any kitchen, big or small, a warm and compelling place to spend time.